It is with sadness that Chuck Burin (Hostage IGOR) reports that Lieutenant General Norman E. Ehlert (Hostage HOTEL), USMC (Retired) passed away September 23, 2002. Norm was a UH-1E pilot on his first tour in RVN and flew UH-1s, AH-1Gs and OV-10s on his second. Both tours were with VMO-2, with some time spent with VMO-5 as well. Our thoughts and prayers are with his family and friends, and we thank him for his contributions to the defense of our nation. 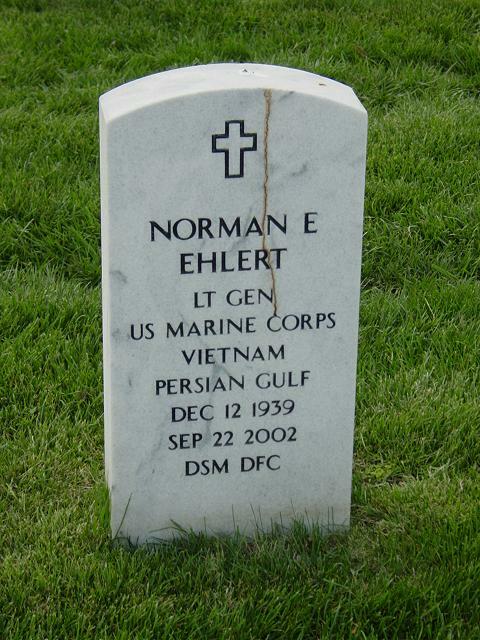 Lieutenant General Norman E. Ehlert retired from the Marine Corps on August 1, 1994. His last active duty assignment was as the Deputy Chief of Staff for Plans, Policies and Operations, Headquarters Marine Corps, Washington, D.C.
General Ehlert received a B.A. degree in Economics from Drake University, and after completing the Officer Candidates Course in December 1961 was commissioned a Second Lieutenant in the Marine Corps. Upon completion of The Basic School at Quantico, Virginia, in June 1962, he entered flight training at the Naval Air Station, Pensacola, Florida, where he was designated a Naval Aviator in December 1963. His first assignment was with Marine Observation Squadron-6 at Marine Corps Base, Camp Pendleton, Calif. In April 1965, he was transferred to VMO-2 which deployed from Okinawa, Japan to DaNang, Vietnam, in the same month. They remained at DaNang and Marble Mountain, RVN, where General Ehlert flew the UH-1 aircraft. Ordered back from overseas in April 1966, he joined VMO-5, 3d Marine Aircraft Wing, MCAS, El Toro, California, where he flew both UH-1E and OV-10 aircraft until October 1968, when he returned to Marble Mountain, RVN and again joined VMO-2. During this tour, he was assigned as the squadron maintenance officer, flying the UH-1E, AH-1G and the OV-10A aircraft. General Ehlert transferred to the 2d Marine Aircraft Wing, MCAS, Cherry Point, North Carolina, in December 1969. During this tour, he transitioned to jets and subsequently joined VMA(AW)-121 as the maintenance officer flying the A-6A. From September 1971 to August 1973, he was assigned to VMA(AW)-242 at El Toro, where he served as the maintenance officer and as the squadron operations officer. Selected for the Advanced Degree Program in August 1973, he attended the University of Southern California, earning his master's degree in Systems Management. Upon completion of school in January 1975,he was ordered to WestPac and joined VMA(AW)-533, MAG-12 at Iwakuni, Japan, serving as the squadron executive officer. In April 1976, he returned from overseas and was assigned to Headquarters Marine Corps, Washington, D.C., where he served as a system resource manager. During June 1979, he returned to the 3d Marine Aircraft Wing and assumed command of VMA(AW)-121. He was reassigned as the MAG-13 executive officer in November 1980. From June 1981 to June 1982, General Ehlert attended the Industrial College of the Armed Forces at Fort McNair. After graduation, he returned to Headquarters Marine Corps as the Head of the Programs and Budget Section in the Aviation Plans and Programs Branch, Department of Aviation. In April 1984, he transferred to the Deputy Chief of Naval Operations (Air Warfare) as the Deputy Aviation Plans and Requirements. He returned to the 1st Marine Aircraft Wing in June 1986, where he served as the G-3. In May 1987, he assumed command of MAG-12. While serving in this capacity, he was selected for promotion to Brigadier General in December 1987. He was advanced to brigadier general on July 22, 1988, and assigned duty as the Commander, Forward Headquarters Element/Inspector General for the United States Central Command, MacDill AFB, Florida on August 1, 1988. Upon advancement to Major General on May 18, 1990, he was assigned duty as the Commanding General, 1st Marine Aircraft Wing/Deputy Commander, III MEF, FMF, Pacific, Okinawa, Japan, on August 6, 1990. From January 1991 until June 1991 General Ehlert was assigned to Saudi Arabia as Deputy MARCENT and Commander Marine Forces Southwest Asia. He participated in Operation Desert Shield and Desert Storm. On July 10, 1991, he was assigned duties as the Commanding General, III Marine Expeditionary Force/Commander, Marine Corps Bases Japan, FMF, Pacific. General Ehlert was nominated by the President for appointment to the grade of Lieutenant General and assignment as the Deputy Chief of Staff for Plans, Policies and Operations on April 16, 1992. Following his promotion to that grade on July 2, 1992. His personal decorations include: the Defense Distinguished Service Medal; Distinguished Service Medal; Legion of Merit with gold star in lieu of a second award; Distinguished Flying Cross; Air Medal with gold Numeral 3 and bronze Numeral 43; Navy Commendation Medal; and the Combat Action Ribbon.